Have I got a holiday for you! Would you like to visit sunny Queensland? Would you like to put names to some of the faces you know from blog-land? Would you like free accomodation in a quiet regional town? All you need to do is bring your spade and your green thumbs. Garden looks great. I hope you'll find it incredibly satisfying to watch them grow and then gorge on them. Noooo... didn't I say no spades?? 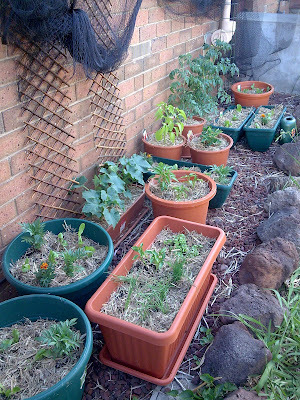 :) As for the green thumbs, please bear in mind that many of those plants I bought TODAY. I didn't start from seeds. Check back with me in a month and see how many are still alive. There was some spinach earlier but it didn't take off so I ripped it out and replaced it with something else. It's tough love in my garden. 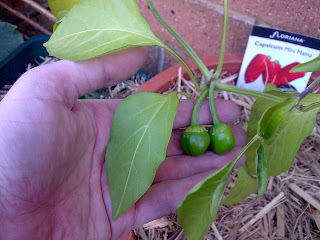 Loved your pregnant capsicums! May they live out their confinements in safety and health. Thank you! I'm not sure if it makes me a mother or a grandmother... although either way it means I'm eating my own young, so perhaps I shouldn't pursue that line of thought.